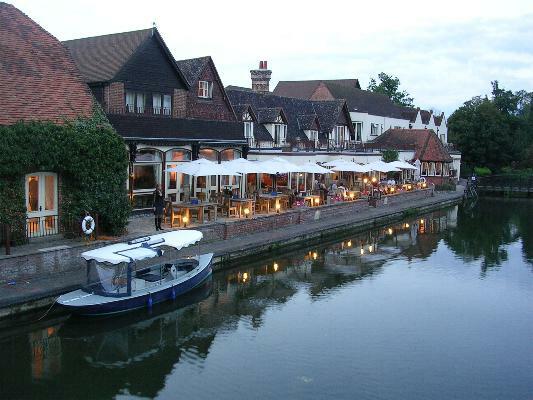 On the face of it Wallingford is an unremarkable market town in South Oxfordshire. However on closer inspection it becomes obvious that no major bus operators serve the place. In fact despite nuzzling between Arriva, First and Stagecoach, none of these companies reach Wallingford. It is Three Free. Thames Travel, a local operator formed less than ten years ago, run all the services in and around Wallingford. These include a route to Henley (above left) in Arriva territory, a route to Reading (above right) on the edge of First Berkshire, and a route to Witney (above) in the middle of the Stagecoach empire that sweeps across the West of England. Out of the 35 vehicles owned, Darts are the mainstay of the fleet (below left), but one impressive Scania OmniDekka is also in service (below right). All photos taken in Wallingford in September 2005. Click to enlarge. Situated on the River Thames, this is the final destination for Three Men in a Boat. Serious food at serious prices, but Sunday lunch is affordable and very popular.